Pumpkin Crunch Dessert will make your house smell like fall. This is a great alternative for people who like the idea of pumpkin, but aren’t so crazy about pumpkin pie. Preheat oven to 350 degrees. Spray 9x13 pan or glass dish with cooking spray. Combine pumpkin, evaporated milk, eggs, sugar, salt and pumpkin pie spice in a large bowl. Pour into pan. Sprinkle cake mix evenly over the top. Pour butter over the cake mix, then sprinkle pecans all over the top. Bake for 50 minutes or until golden brown. 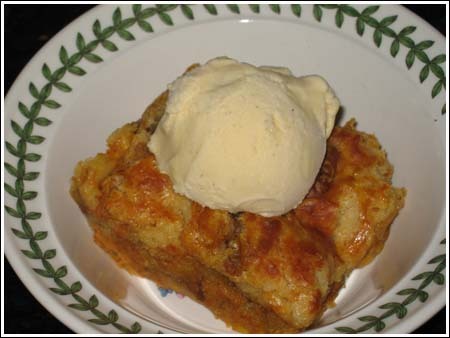 Let cool completely then cut into squares and serve with a scoop of ice cream. « Good Source for Baking/Craft Supplies! Just found this site and wanted to let you know that my mom, who is allergic to evaporated milk, always made up powdered milk really thick to substitute in pumpkin pies. I don’t know the proportions, because I found recipes that used condensed milk when I started making pumpkin pies myself. Kay, I wish I had an answer for you. Are you sure you’re not confusing evaporated milk with thick, sweetened condensed milk? Evaporated milk is the thinner kind that is unsweetened and comes in a can. If that’s what you mean and you just don’t like it, you might want to try using half & half. Hi! I recently started loving pumpkin too! I was just wondering, what can I substitute for the evap milk as I am not too fond of it? I made this for a dinner party and it went over really well!! I cannot stop at just one piece (thankfully I cut them small…) I am a pumpkin pie lover however, this just may be better than pumpkin pie! Loved it–will certainly make it again. When I make it, I think I will try mixing the pecans with a bit of melted butter, brown sugar, and a dash of cinnamon before applying to the top of the cake mix. In my opinion, it’s much better than pumpkin pie. I like well-made pumpkin pie, but this has the added texture of crumbly cake and the crunch of pecans. Just for fun, I’ll probably try out a few pumpkin pie recipes too. That is, between now and Thanksgiving. Wow, this looks good. I wish my family liked non-chocolate desserts more. Do you think it was better than pumpkin pie? That’s a good question, and the answer is canned pumpkin — not pie filling. I’ve never used it, but the canned pie filling has other ingredients mixed in. This recipe uses plain old canned pumpkin. I’m going to note that in parenthesis. Is this made ith canned pumpkin or pumpkin pie mix in the can??? Thanks and it looks great. I have been ghosting y our blog for months and I love it. Melanie, I put “pumpkin dump cake” into Google and came up with many variations. Above is how I finally ended up making mine and it’s cooling as I type. It smells great and the worst thing is waiting for it to cool. This is called pumpkin dump cake in our neck of the woods. Also, I don’t melt the butter, but rather cut up 2 sticks into little pats & put on top of the cake mix. I’m sure it turns out the same, though. Excellent, excellent stuff. I’m always asked for the recipe. Hope you like yours! Ack, I’ve had to edit the recipe. Not that it matters because it sounds like you all have this one :). I thought mixing the butter with the cake mix would work, but it turned into a batter which could not be sprinkled but ratherm, SMEARED. So the proper way is the sprinkle the cake mix and pour on the butter. I guess with a full cup of butter, there’s no way the butter’s not going to get to where it needs to be. Cindy, that’s good to know. I think a lot of people in the states just make their own self-rising flour. I have your oatmeal cookie recipe in my file and ALMOST made it today but got sidetracked. For those who don’t know what we are talking about, Cindy is referring to the earlier version of Quaker’s Best Cookies. I just use l cup flour, 1 1/2 teaspoons baking powder and 1/2 teaspoon salt. Once I even made it with regular pumpkin instead of pumpkin pie mix, estimating the extra sugar and eggs, and luckily it turned out fine! Did you ever try the other oatmeal cookies? Cindy, thank! I didn’t know Desperation Dinners had a web site, but I do like their books. Here’s a link to the pumpkin cobbler. They use self-rising flour. I’m thinking of starting a category of recipes using self-rising flour. Thanks for the input. I am getting ready to go bake this right now. I looked at a few other versions and decide to cut the sugar to 1 cup rather than use 1 1/2 cups. It sounds good, but my favorite replacement for pumpkin pie is Pumpkin Cobbler, which I got from a Desperation Dinners column a couple of years ago. Glad you finally are getting to try this gem of a recipe Anna. Like Anj, I prefer this more than pumpkin pie. I’ve tried it( someone else made it). They made it with margarine so I didnt enjoy eating it. This recipe has taken the place of pumpkin pie on my holiday meals for a while now. It’s the just the best stuff. If it’s good, you can have the rest. I was thinking about halving it and making it in an 8 inch dish, but then I’ll obsess about using half a can of pumpkin, half a can of evaporated milk and half a box of cake mix and half and egg.